We would take this opportunity to introduce your good self to our newly formed trading concern - KPI Overseas (p) Limited. KPI deals in rust-preventive (VCI) packaging products imported from England. KPI is the sole distributor of API Coated Products Limited, England, for their VCI range of products in India. VCI(Volatile Corrosion Inhibitors) are the clean, safe & effective alternative to conventional Rust- Preventive products such as oils, greases, desiccants, etc. Our VCI products are nitrite-free, nontoxic & environment friendly. Today, quality is the essence of success for any product. However, even the best quality comes to a naught due to the presence of even a pin-point of rust. The loss due to corrosion runs into billions of dollars per year. We are sure, that as a manufacturer of quality products, you would sincerely wish to protect your products from rust. We can offer you world-class rust preventive products at economical prices to put an end to all your rust-related problems. We take this opportunity to introduce ourselves as the sole distributors of API Coated products Ltd. England, for their rust preventive products . We are giving below a brief introduction of API. API Group PLC is a multinational progressive group with a turnover of $ 164 million per annum, achieved through a number of specialized manufacturing facilities in Europe and America. 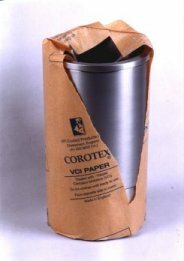 API Coated Products Ltd. A member of this prestigious group, specializes in the field of rust preventive packaging- VCI (Volatile Corrosion Inhibitor) papers & films for ferrous, non-ferrous and multimetal applications. Apart form manufacturing & marketing their products in their own brand name directly, they also manufacturing and supply VCI products to a number to leading companies in their respective brand names worldwide. API through it`s network of dealers and associate companies supplies to major automobiles and machinery manufacturers worldwide, such as Ford, Opel, Rover, Rolex, Dunlop, Renault, Peugeot, Hoerbiger, Bobst, Sulzer, Kienle & SpieB, JCB, Valeo, British Steel, etc.